Ayrton Senna runs out of fuel in the last lap, a heartbreak for the then-dominant win of the Brazilian. In the lead-up to the weekend, many were excited to see a close battle for the title. Gerhard Berger had an advantage over Voeckler coming into the race, but it was heavily reduced because of the 11 best results rule. Qualifying dashed all hopes for a close title battle, Voeckler setting the fastest lap time by quite a margin and the only driver to get below 1:18. Not even his awful start hampered him, as he was able to reovertake Berger easily for 2nd place, and where he spent the majority of the race on. After taking the lead in the first lap, Ayrton Senna went away and was never seen again… until the final lap. 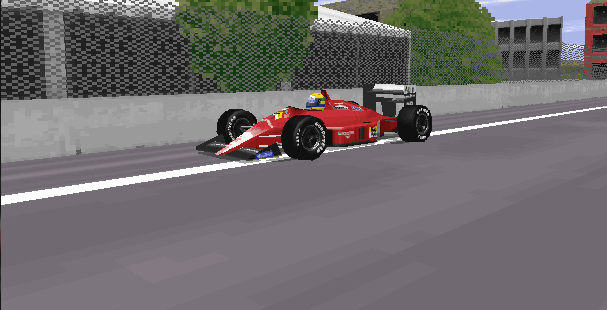 After a miscalculation from the Ferrari crew, he was underfueled and ran out of fuel in the first sector entering the last lap. Thus, Jeremy-Etienne Voeckler took the victory and the title, a nice way to end the season. Gerhard Berger was 2nd, and to show how dominant the win was up to that point, Senna was still classified as 3rd, finishing in the podium. Despite a error that costed him some time, Nigel Mansell was 4th. Minardi finished the season in a sweet note with a 5th place from Frederic-Maxime Voeckler, and Kazuki Fushida got a fantastic 6th place, what could have been a 5th place had he not had Mansell in front of him while he was spinning. Infinite Improbability Drive Of The Race – Kazuki Fushida, takes only point in the season with a superb drive. Reject Of The Race – Ferrari, one driver runs out of fuel and the other has a mechanical failure – not exactly a nice way to end the season.